This was the year that four of us from the Einherjar Gaming Group decided to compete at the European Grand Tournament being held at Tabletop Nation in Hockley, UK. We had talked about it for many years and finally decided that this would be the year. Since it was a special occasion also decided to make a road trip out of it by leaving a day earlier in order to visit the Tank Musemum at Bovington. For my actual tournament force, I decided to field my always dependable US Armored Rifle Company from the 4th Armored Division. I usually run them artillery heavy but given the high variable factor of artillery I decided to change it up a bit and take a stronger armoured component to deliver firepower or to put it simply, more dice. 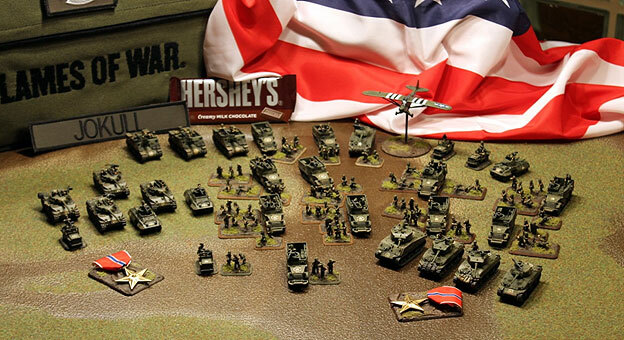 In the spirit of the World War II-era GI, I also took with me a supply of Hershey chocolate bars to give to my opponents. Traditionally, I should have stockings for female opponents but I did the math on that happening and just took Hershey bars. Right: My Armored Rifle Company from the US 4th Armored Divison complete with Hershey's chocolate bar. The first hitch on our journey was the airport security check; since I took my army with me a carry-on luggage it was Unsurprising that a miniature mechanised company caused suspicion. But after opening the case and some strange looks from security personnel I was allowed through. The rest of the journey was uneventful and soon we were sitting in our Go Fast Red Vauxhall Astra in the largest car park in England which is sometimes called the M25. It is a highway that circles London and was designed for all incoming traffic. What the planners failed to anticipate the number of Londoners that would want to use it and therefore it is much too small. We did manage to see Stonehenge on our way to Wool were we stayed the night since we planned to spend the entirety for the following day at the Tank Museum. 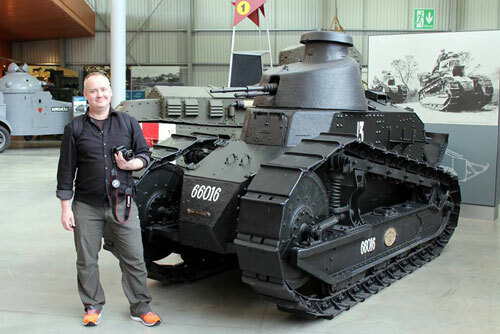 Left: Standing next to a French Renault FT-18. I cannot put into words our day at the Tank Museum. 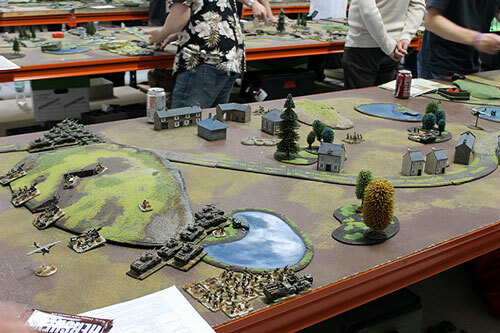 For any Flames Of War player it is like a pilgrimage or rite of passage. After countless hours of assembling and painting models getting to see the actual vehicles in real life was mind blowing. A Flames Of War player will appreciate the Tank Museum far more than your ordinary person or even one with historical interest in World War II; you know your tanks and here they are as larger than life. 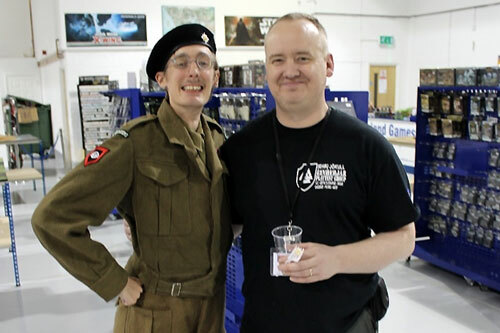 In all we spent six hours at the tank museum as only four Flames Of War gamers could, not troubled by our less enthusiastic family members, girlfriends or wives. The most awe inspiring exhibit by far it the Zimmerit covered Königstiger; it almost seems as if the other tanks on display orbit it like a solar system. Of course there are plenty of other very nice displays on offer including a gallery where the tanks are laid out in the order of tank development or simply the History of the Tank exhibit. I highly recommend visiting the tank museum to all Flames Of War enthusiasts. 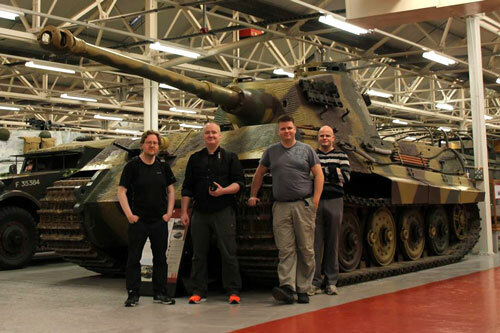 Right: From the left; Rúnar, me, Brjánn and Andri pose in front of the Königtiger. Our trip back to London was almost as eventful as visiting the tank museum. Mostly impart to the involvement of our Vauxhall rental car. It was so underpowered that even climbing the rolling hills of Southern England was pushing it to its limits. It Go Fast Red colour was very misleading as were constantly being overtaken by other motorists and the only vehicle we managed to overtake was a tractor. It seems that Vauxhall has let things slip since it made the Churchill tank, which although not fast in its own right, was noted for hill climbing ability. Still the car was and will be a source of merriment for years to come so that in itself was worth it. Left: What we discovered under to bonnet of our rental car. The guys dropped me off in East London so that I could meet up with an old friend and pushed on without me. But with them gone I needed another way to make it from East London to Hockley the next morning in order to make it to the tournament. I posted on the forums that if anyone was passing if they could give me a lift and David Madigan was nice enough to offer a ride. This was evidence of the goodwill and kindness shown within Flames Of War community to a fellow comrade in arms. However, it wasn’t quite as simple as all that. My friend suggested meeting at the Lakeside Shopping Centre near the M25, but that is situated right in the centre of retail parking hell. David and I spent around 25 minutes finding each other; David even attention of the police for going through the same roundabout five times but in the end we made it to Hockley. Never heard of Hockley? That makes two of us. 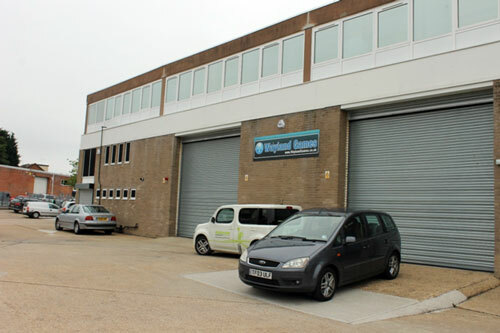 But it is the home Wayland Games and their very large gaming hall that proved an excellent venue to host the European Grand Tournament. Below: ...inside is where it happens! As luck would have it my first opponent allocated randomly was David Madigan. 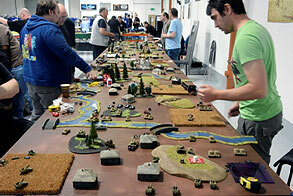 With around 70 players what were the odds but proved an unexpected pleasure. 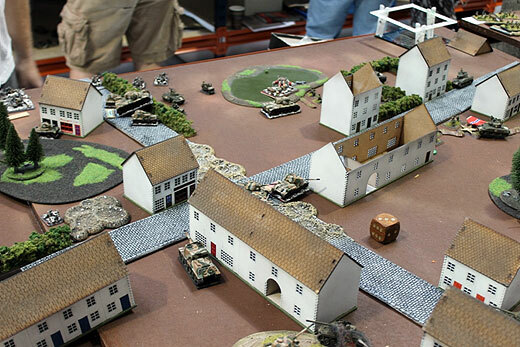 Our mission was Dust Up and David ran a German Panzerkompanie consisting mainly of Panzer IVs. I was confident going in; and my M18s and 76mm Sherman 76mms come out on top in the end. Early on in the game almost won on the back of a bold charge by an armored rifle platoon. But David was lucky with his defensive fire and after that his skilful battlefield management allowed him to counter my advance, denying me the ability to use my M18s to their potential with the use of his Recce Pumas. In the end a hard fought 4-3 victory to David; a great opponent and person. Below: Mr. David Madigan, a true gentleman. Below: The table for my first round match-up with David in Dust Up. My second battle was against the Welsh Mercenary Ian Crosby. This was Hold the Line against Ian's 7th Armoured Division led by Patton; a blue on blue training exercise. As he ran a full armoured company and I defended. Running an entire company of Trained 75mm Shermans with Detroit's Finest he did have the numbers on me and in the end this proved the difference as I started to bleed fast. I failed to take out a single platoon, but then the Armored Rifle platoons with their bazookas are also hard to shift. With time up, the game was undecided and the tradition at the European Grand Tournament is that that gives the defender a win. So as it stood it was 4-3 since he had by then taken out three of my platoons. I am of the opinion that the defensive battles usually favour the attacker so this makes sense to me. In fact I think the mission would be better with such victory conditions. Giving there a set number of turns or a variable end like dawn or something would force a more decisive battle. I'd like to thank Ian for a game well played. Below: The table for my first round match-up with David in Hold The Line. Below: The Welsh Mercenary, Mr. Ian Crosby. The last battle of the day was against Keith Martin-Smith and his British Rifle Company supported by three Breaching Groups. The mission was Hasty Attack and with his British elected to invoke Always Attacks and Night Fighting rules. Stopping his Commandos before they reached my lines proved to be the high water mark for me and nothing seemed to go right for me after that. 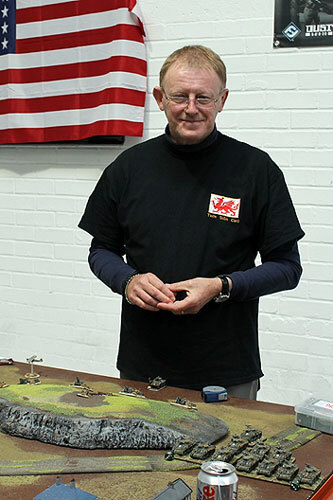 I managed only to take out only one of Keith’s nine platoons and all credit must go to Keith for playing very well and making no mistakes for me to take advantage of. In the end a well deserved 6-1 victory for Keith. Below: Keith advances for British Rifle Company in round three's Hasty Attack. At this point Team Einherjar made good their promise to Gareth Richards of Battlefront and offered all present cured shark meat and Icelandic beverages. Despite only bring a single jar, it proved more than enough for everyone who wanted try it since most people, how can I say it politely declined the opportunity. Cured shark is an acquired taste but more so it is the smell that proves offensive. It has something to do with the fact that the Shark never urinates during their lifespan, this causes ammonia to build up in their flesh. The best comment goes to one of the Finns who said "It tastes like chicken." A red flag was immediately raised to never eat chicken while in Finland. 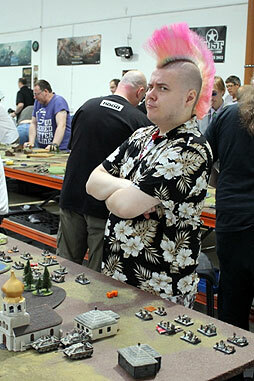 We also made a new friend in David who you may have seen in the Beasts of War video series Flames Of War: For The Win. David was kitted out in full British battle dress and was brave enough to sample our offerings, for which I should apologise to his wife. Below: Wargamers; if its free they'll try it. Below: I pose with David of Beasts of War fame. The next morning my teammates did make a little fun of me for being in the senior league. 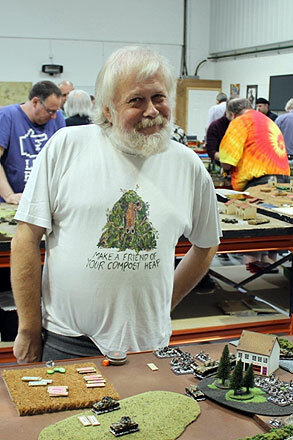 Well, no problem there; older players tend to be more relaxed but my first battle did continue on that theme when I met my next opponent Mike Klaka. Mike had a very pleasant demeanour and his objective of Santa Claus was very fitting. Left: Mike's Santa Claus objective. 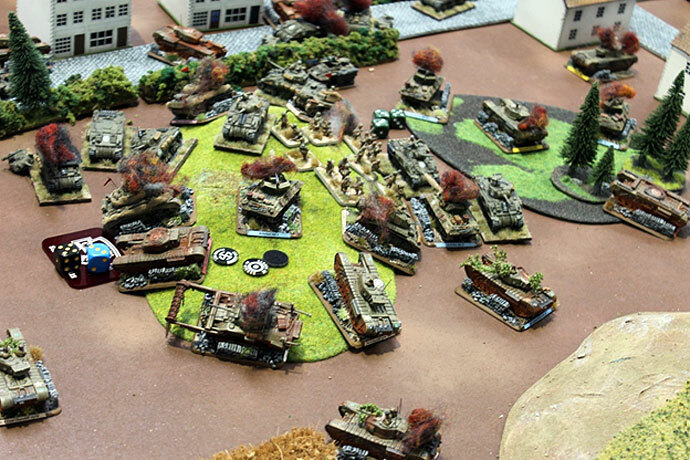 In fact it took my combined efforts of both the M18s and Shermans four turns to take them out, a combination of some poor shooting followed by numerous failed firepower tests. 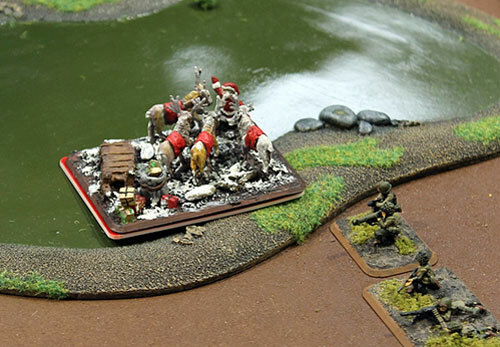 But in the end I managed to halt his advance but at the cost of all but two of my platoons. Mike did not give an inch and fought on, hoping to force a company morale test. However, I was first to get him below half strength but his Fearless rating proved Fearless. For me Confident is more like "I'd rather be somewhere else. 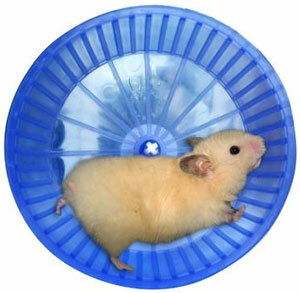 "; Reluctant is "Run away at the first chance." and Fearless is "Maybe we'll might stick around a bit." My only option was to take out Mike's 2iC since his Company Commander was already destroyed before he brought me under half strength. And I did. So a 4-3 win against a pleasant and determined opponent. Below: Fighting over the town in round four. Below: Mr. Mike Klaka, one tough cookie on the tabletop. During the lunch break one of the Finnish player came to ask about Operation Polar Bear in Iceland in February. When they called for the last round of battles he also turned out to be my last opponent. 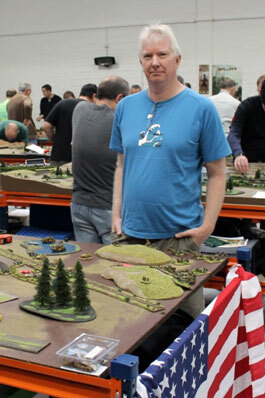 Juha Jokinen from Finland playing Jagdpanthers in Encounter. His army was a real pleasure to play against. The modelling was top notch and the amount of detail Juha has gone to was terrific. 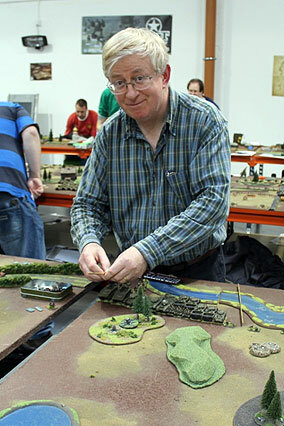 He was also great to play against although the table did favour his army. A river ran through it and there was lack of cover allowed his 88s to have a field day. I did manage to cut off one of his thrusts and played boldly myself. Neither of us had a chance of winning the tournament so we were able to play a fun, relaxed game. 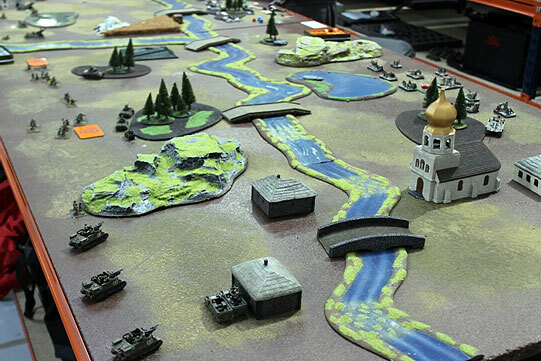 Eventually the game turned to Juha’s favour, especially after a particular good round of shooting and me failing nine out of ten infantry saves; which is statistically about the same as playing a female opponent in Flames Of War. Final result, a 4-3 victory to Juha. Below: The colourful Mr. Juha Jokinen. Below: The terrain for round five's Encounter. At this time my fellow Team Einherjar members had also finished their games. None of us had done particularly well but this was our first time at the European Grand Tournament and there were many good players at the event. It also dawned on me that in every single battle I had started with half my army in Delayed Reserves! Dust-Up, defending in Hold the Line, defending in Hasty Attack, defending in Pincer and Encounter. But in all honesty, yes, winning is good, but there are only a handful of winners in a tournament this large. Play hard but remember to have fun, because after all that is the main reward for most of us. 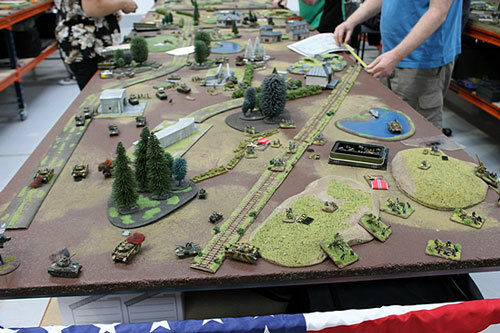 What a tournament offers more than anything else is the chance to meet and play against new opponents; play against different armies than what you are used to and make a new friend or two. With that in mind my time in Hockley met all these expectations and I will look forward to going to my next tournament abroad and see who comes to Iceland in February. 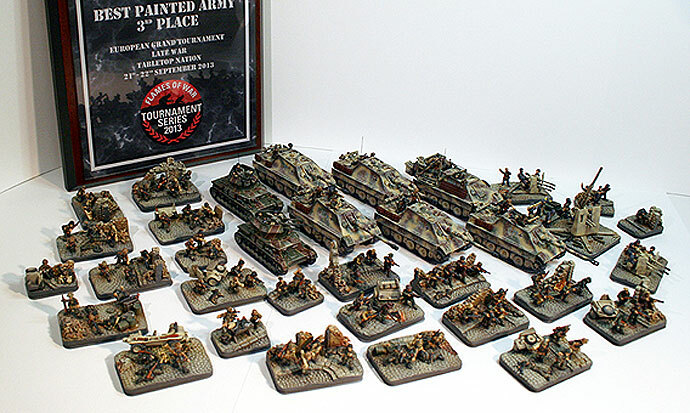 Below: Juha's army won third place for Best Painted Army painting. Below: The detail of some of Juha's models was mind blowing, look for the piano and bicycle. "Well, at least there was no blood spilt." was the reply that came from the security guard. A fitting end to a hard fought weekend. To my opponents and tournament organisers my best thanks for making this a rewarding experience and a wonderful trip. For peace and trust can win the day despite of all [my] losing.